Natural soaking areas are mostly threatened by developers. Away with the traditions, in with the wellness. But at a price. Development is mostly poorly done with little or no regard for local needs, all on the basis of pipe dreams: cash. But more often than not this cash is not forthcoming and the new owners of the previously publicly held entity now flip the premises to others who build more. If anything this blog seeks to endear the traditions and bath in the naturalness. But the truth is that the future is more concrete, literally. A lead article from scidev.net (July 21). On Himalaya's geothermal potential. Basically more could be done with it. 'Thousands of megawatts of geothermal energy remain locked up in the Himalayas because of environmental considerations and lack of investment in research, say international geologists'. Another article can be found here..
'around 50 kilometers south of Arslenbob in the city of Jalal-Abad atop a hill is an old ex-Soviet spa/sanatorium. 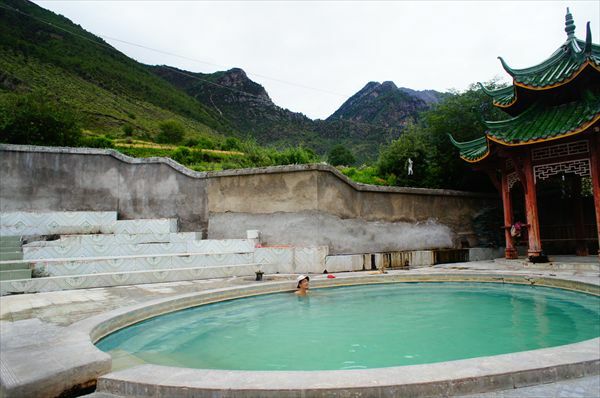 these giant decaying facilities are speckled throughout Central Asia but this particular one happens to be built around a hot spring. after several failed attempts at trying to navigate my way through the confusing Kyrgyz bureaucracy, i was finally able to book myself a “mud treatment”. i was lead swiftly by the arm by a very helpful, very persistent nurse to the lower levels of the sanatorium where i was met by an older gentleman wearing a rubber apron and rubber boots. he lead me through a door where a long hallway of tiled cubicles stood, poured a bucket full of hot smelly mud into a plastic covered bed and then made a few hand gestures that suggested i should strip naked and lay down in it. there are times when getting naked is an easy, natural process but this time was most certainly not one of them. i had come too far to turn back now. the strange Kyrgyz man in the rubber suit with bucket in hand was waiting patiently for me to keep up my end of the bargain. all i had to do was get those clothes off and… ya know… lay down in that mud immediately after. and so i smiled at the nice man, who was still standing there of course… and then… well… did exactly that. before i could fully come to grips with how vulnerable i felt lying there naked in the smelly hot mud, the man just laughed and then dumped a bucket of scolding hot mud all over me. then he folded me into the plastic sheet like a burrito, covered me in additional wool blankets and poured in two additional buckets of mud, one in the opening at my feet and another in the opening at my neck. then he shook me back and forth and then walked away. as pain turned into pleasure, my face began to itch uncontrollably. i was cocooned, hot and helpless. then an overwhelming sensation of deep relaxation washed over me and seemed to penetrate my bones'. After long trip to Tobolsk Hot Mineral Terms near Tyumen, 40 degrees of relaxation! 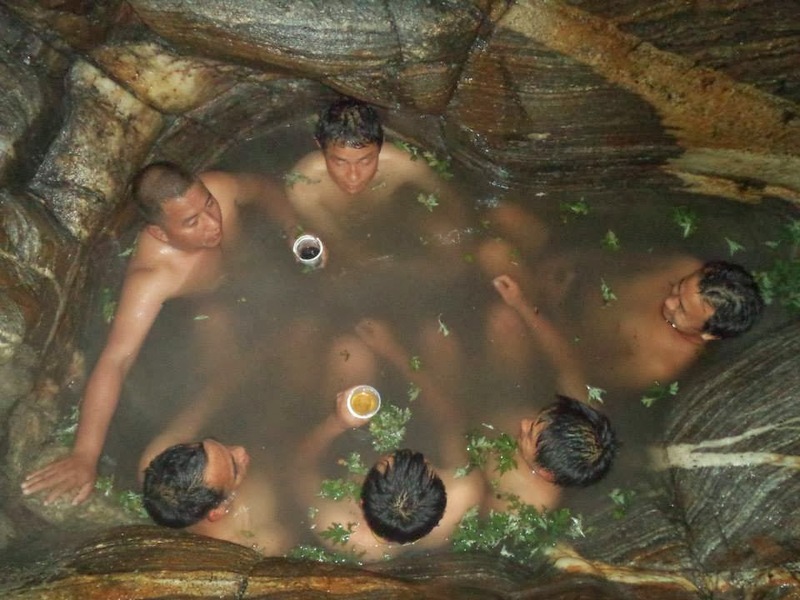 An interesting and different article on Bhutan's hot spring baths by ktshering. As far as my knowledge goes, no scientific studies have shown the water to have health benefits but Bhutanese will not mind continuing with the practice. The placebo effect, good meals and societal bonding during the process may be some of the reasons attributable for the revival of health'. No. 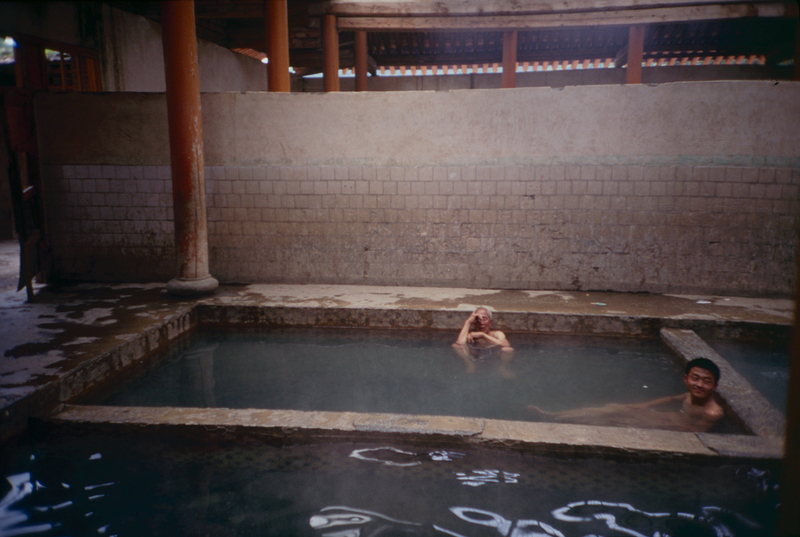 5 is from Tibet (Garze) which includes the strange notion of racy photo's on the wall surrounding the tub. No. 8 is likewise from Tibet, Tirtapuri. All-in-all nice photo's.